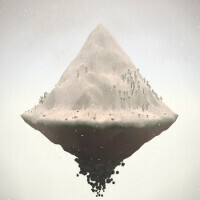 Created by David OReilly, one of the artists behind Her, a 2013 award-winning drama, the Mountain is a peculiar mobile game that is bound to hit iOS soon. In this pretty curious title, players will faced up all kinds of weird and downright disturbing "psychologically invasive" questions, regarding love, hate, and... their mothers. Instead of answering, however, gamers will have to express their answers by drawing a picture. After all of the questions have been answered, the game will turn the drawing into a floating, three-dimensional mountain. What do you get to do with it afterwards? Well, how does simply watching it evolve sound to you? That's right, you only get to rotate the view around your creation and carefully observe it. Still, the mountain is not just an ordinary piece of flying rocks – its "alive". You'll observe day and night cycles, as well as changing of the seasons. Whenever you open the game, you'll be able to continue watching your mountain for roughly 50 hours. Weirdly enough, it is said that the Mountain has an ending and is not your usual sandbox simulation. The uncanny game is set to arrive on iOS sometime after June 21. There's no word if it will make its way to Android, though. Quite beautiful, to be honest lol. And? Don't really see how this is a 'game'. Sounds more like an NSA information gathering application. "Instead of answering, however, gamers will have to express their answers by drawing a picture." This potentially could weed out the shakey ones to one group or another. What do you see in the pictures, lol excellent.